Surprise your family and friends by adding a little Northern Michigan charm to your holiday wrapping this season. 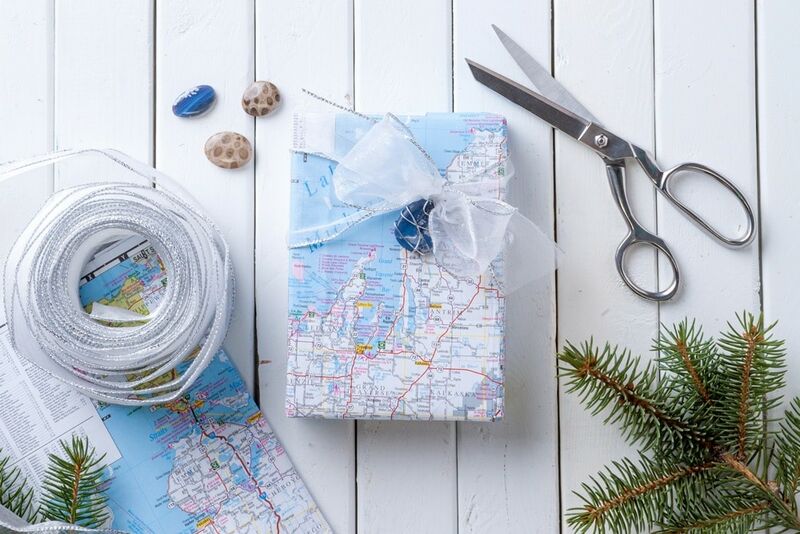 Here’s how to create Michigan map gift wrap! Begin this project by wrapping your box with the Michigan map. Take special care to highlight any areas or towns on the map that you want to stand out. (We tried to include as much of the Northern Michigan coast as we could.) You may need to cut or fold down the map to fit the shape and size of your box. Carefully tape down your edges and move on to the next step. The ideal stone for this project is less than two inches in diameter. Using a polished Petoskey stone or Leland blue will have a refined appearance, but you may also like the familiarity of gifting an unfinished stone that you have found. Using the bead wire, create a small eraser-sized loop at the top. Twist the loop into an eyelet shape. This will be used to attach the stone to your map-wrapped gift. Next, take the remaining bead wire and carefully wind it around the stone to create a wire cage. The bead wire should be easy to bend with your fingers but you may need to use pliers for added pull. Once the stone is secure, wrap the end of the wire around the eyelet and cut off any remaining wire with the pliers. This small stone charm is now fit for decking the halls, wrapping presents, hanging from Christmas trees and maybe even for a simple necklace. Watch this MyNorth video to see how to polish stones! Now it is time to bring all the elements together. Take a segment of ribbon that has been measured to a length long enough to go around your box twice and carefully thread the Petoskey stone or Leland Blue charm that you have made onto it. Tie the ribbon into a bow and you are done. It is that simple. Try adding multiple stone charms. How about a nautical map? Have the kids draw their own maps and drawings of Northern Michigan and wrap their gifts to family in those. There are many ways to bring Northern Michigan into your holidays.